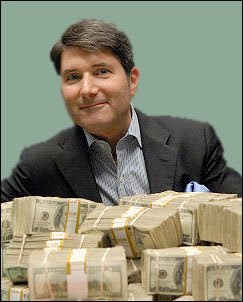 Andy Behrman -- aka "Electroboy" -- is being raked over the coals for first shilling for BMS' drug Abilify (for which BMS paid him $400,000), then "shaking down" BMS for a new contract and then launching an anti-Abilify campaign when he didn't get it (see "Andy Behrman, Now an Anti-BMS Spokesperson, Says 'Ask Your Doctor If Abilify is Wrong for You'"). * Is it appropriate for pharma companies to pay patients such huge sums to promote their products? * Is this done often by all pharmaceutical companies or is it just something unique to BMS? To answer these questions, I will relate a personal story where I was involved with another patient paid huge sums of money by BMS to advocate another product: an anticholesterol drug. Way back in 1994, I launched a drug information Web site called PharmInfoNet. It was a popular site and we worked with many pharmaceutical companies that placed ads on the site and that provided funding for physician education programs (we summarized presentations made at medical conferences and published them on the site). I was often contacted by entrepreneurs who wanted to work with us to develop and promote their own websites. One day a young guy -- let's call him Wayne -- called and said he wanted to launch a site related to cardiovascular health and wanted me to help, maybe be a partner. Wayne had a heart attack not long before he contacted me -- he was maybe 30 years old at that time. It was nearly fatal. After his recovery, Wayne's physician (let's call him Dr. Raider), a key opinion leader paid by BMS, prescribed a BMS anti-cholesterol drug for Wayne. When I first met Wayne, he told me about how he was hired by BMS to be a spokesperson -- along with Dr. Raider -- for BMS' drug. Wayne was featured on patient brochures and went around speaking about his experience to wherever BMS sent him. Although Wayne never told me how much he was paid by BMS, I knew it was serious money because he had a lawyer and was spending a lot to build his Website. The site also received major financial support from BMS. At the time, I did not think it was inappropriate for BMS to pay Wayne to be a spokesperson. Kudos to him!, I thought. Wayne and I were partners for a time -- we exchanged links and content between our sites. Eventually, we both sold our websites to another company and went our separate ways. I cite this story as anecdotal evidence that "Electroboy" was not the first patient BMS paid to promote a product. Wayne had not even been a famous author when he was paid by BMS to promote its product. I suspect that even today, other non-celebrity patients are being paid by BMS. Is it just BMS doing this? Or are other drug companies also paying patients to "tell their stories?" "There are plenty of pharma companies that handle patient relationships responsibly, plenty of patients that behave ethically, and thousands of people who have benefited from other patients sharing their stories in meaningful ways. And of course the WSJ chose NOT to focus on them. In my experience companies are extremely conservative, careful and ethical with these relationships. Patients speak in their own voice and are treated with respect. Yes, their words are edited. But honestly most of the editing-out is of the overly positive ('this drug saved my life' or 'I felt better immediately'), always striving for a more typical and balanced representation." I also believe that people benefit from hearing other patients' stories and, as Wendy points out, that's what makes social networks so useful for patients. However, when some patients are paid huge sums of money by drug companies to "speak in their own voice," I suspect that this "voice" is not authentic and most often there is a lack of transparency about who pays for the "voice." Patients want and need to hear "voices" without the slightest chance of bias. Given the odds that this can happen when the voice is paid for, it becomes necessary to ensure transparency. But even transparency is NOT enough. Drug companies simply should NOT pay for these voices. They should certainly not pay hundreds of thousands of dollars! If pharma really wishes to engage in social media, they need to find voices that are already partial to their products and support them WITHOUT direct payment. Here's an idea: Instead of handing bundles of money to patient spokespeople, drug companies can donate the money to the patient's favorite charity -- preferably one not set up by the patient (Wayne and his lawyer had set up such an organization through which BMS funneled him his cash). Should Pharma Pay Individual Patients to be Spokespeople for Their Products? I was a rep. for three of the largest drug companies in the world, and this did not include BMS. Yes, all three utilized patient spokespeople. In addition, such companies hire doctors to attend such meetings with sales reps. so they can sit there and hear their pitches as they grade them. No, patients should not be spokespeople for the companies that make drugs the patients may take intended to restore their health or delay the progression of their disease states. Andy Behrman only spoke out against BMS after BMS chose not to honor his request for a contract that exceed 7 million dollars. He received about 10 thousand dollars for each talk he gave or attended by BMS. If Andy had problems with Abifly, which I believe, he should have some honor and spoke up regardless of financial incentives, or lack there of. I totally agree! I can only suggest what's proper for pharma, not patients. They'll have to answer to a higher authority. I find it surprising that regulatory and legal departments would allow such large sums of money to be paid to patients and spokespeople - even famous ones like Magic Johnson and Lance Armstrong - and that the FDA allows this. What happened to reasonable compensation for reasonable contribution? I know, I know, if the pharma company is willing to take the risk with the FDA, marketing will do what they can to sell product. BMS deserves what BMS gets. I would suggest that the remedy is not to ban compensation, but to require disclosure. Certainly, there should not be any tricky distinctions between "direct" and "indirect" compensation. Consider that guidelines for blogger comments under consideration by FCC would consider ANY consideration (for instance, a coupon or a free-trial loaner of equipment) as compensation. Banning compensation begs the question of where you draw the line: celebrity physician? OK to compensate (but not in lavish amounts); celebrity actress? OK to compensate (SAG scale, perhaps? ); celebrity author/patient? not OK? Totally agree with previous comment from Mario. Nothing more to say! Be transparent and honest with you customers.